Filth Wizardry: Home made superhero fleece poncho-cape. 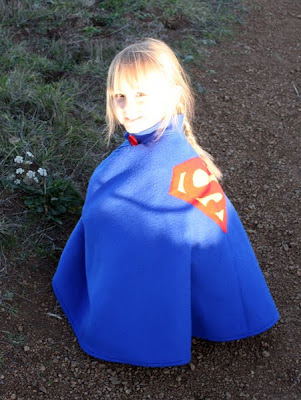 Home made superhero fleece poncho-cape. Sounds a bit odd doesn't it? These were one of the presents that I made for my girls this Christmas. They are pretty into the whole superhero thing. They have Batman and Superman PJs and wanted capes, so I thought it would be a nice idea if they had capes that could double up as cold weather ponchos. I used one yard of blue fleece for the superman poncho and one yard of black fleece for the Batman one. I got the little bits of yellow and red fleece from the remnants section, so they were pennies. 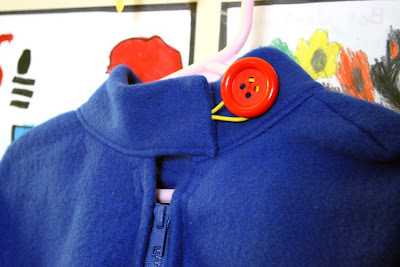 I also used two 16" chunky zippers and two nice big buttons. I thought the kids would find it easier to do up and undo if I sewed in a hair bobble to close the button, rather than sew button holes (easier for me too, let's be honest). The fleece appliques on the backs were done by hand. 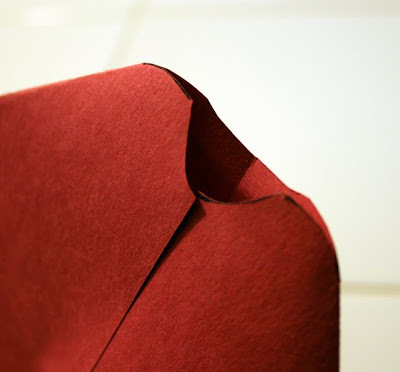 Here's how I cut the shape of the cape to sew up. 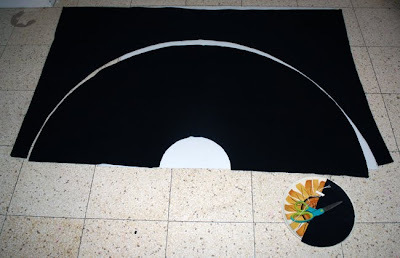 I used a piece of chalk and some string to make a big compass, so that I could cut out a big semi circle from the yard of fleece. 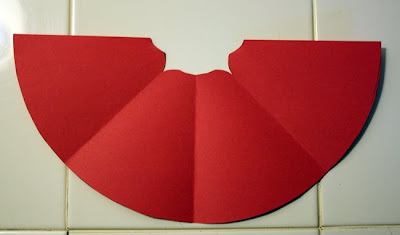 I cut out a smaller semi circle for the start of the neck part of the pattern. Oooh, look at my grotty kitchen floor and seventies crockery! From here on out you get a faux tutorial using paper instead of the actual cape, because it was all done at stupid O'clock at night with pants lighting and I didn't think you'd be able to make out anything of the black and blue fleece. 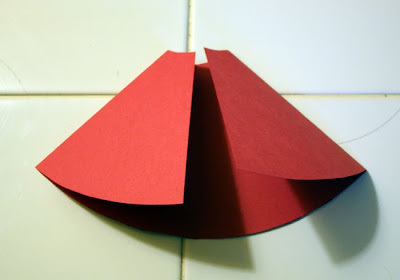 so here's the semi circle with the little semi circle cut out in paper. You get the idea. It's far from rocket science, but as i was typing out what I did it started to sound more confusing than it should be if that makes any sense. 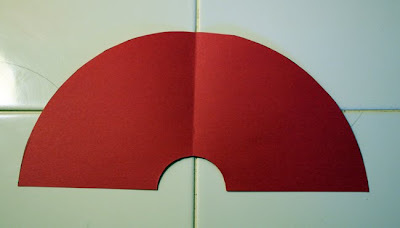 Then I folded the two sides in to meet in the middle, so that I had a quarter circle (as though looking at the poncho head on, flat on the ground) From here I cut the curves of the shoulders. Next I openned the cape back up and folded it so that it was in half (as though you were looking at it side on, flat on the ground. From here I cut out a lower neckline for the front of the poncho. All cutting done. Sew up the shoulder seams and hem all around to give it a bit more structure and stop the bottom of the cape stretching over time. Sew in the zipper and then you just have the collar to put on. I just cut a length of fleece from the left over, folded it in half to have double thickness and about one and a half inches height for the collar and sewed in the hairbobble while I was at it. They worked out a great fit for my nearly four year old and just turned five year old. The length on them was good too, because it allowed them to crouch down without the poncho dragging on the floor. If I'd had more time and appropriate fabric then it would have been really cool to put a silky/satiny yellow material as a lining for them. I'll probably make more as gifts though, so I'll try that at some point in the future. I also want to make a very small wonder woman one with a felt wonder woman crown for a specific wee lass. Here are some pictures of my two galavanting around on the hillside on Christmas day afternoon, rocking the cape/ponchos. Big filth wizard liked hers zipped up and little filth wizard opted for the open cape style. Sewing isn't exactly my forte. I'm much more comfortable hand sewing than machine sewing (I'm hoping to change that in the future though), so if I can manage this then I think just about anyone can. I do have a fair bit of the yard left over, so if I can manage it then I'd like to make some indoor slippers that look like knee high superhero boots to go with the capes. too cute, I won't be letting my son see this post! Love it. The girls look so dramatic as they play in them. 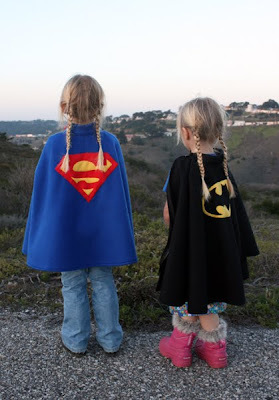 How empowering for your daughters to be superheroes. These rock, thanks for sharing. So cool! I've been reading you for a while, but haven't really commented. I nominated you for an award on my blog today! 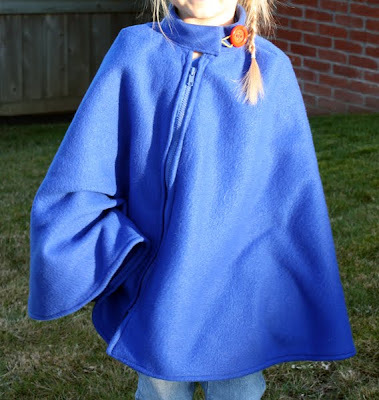 Gorgeous capes, and great thinking to make them out of fleece for cold weather! What an awesome idea and tutorial! Love it! Thanks so much for posting. 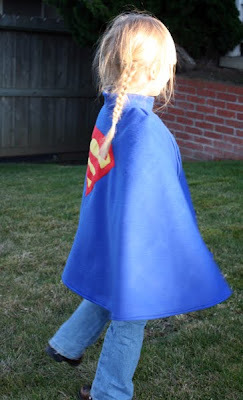 Brilliant use of fleece and the best DIY cape I've seen yet. Bravo! Your blog keeps me wanting to make messes with my kiddos, and for that, I MUST give you an award! KM! Absolutely fabulous! I've seen some of those satiny-lined superhero capes and I have to say, your fleece-zippered-hairbobble-bigbutton-collared-superhero capes beat them ALL hollow. ALL. Stupendous! STUPENDOUS! I think a large part is due to your eye for precision in the details like the logos - I've seen some that just sort of wing it (pun unintended) and cut a general winged-animal shape and declare it Batman. 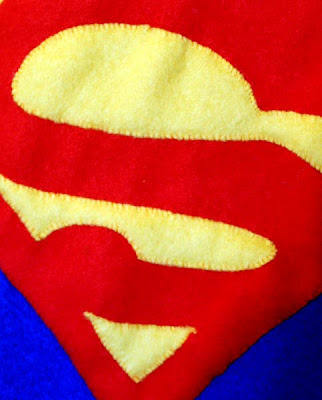 Your logos rock, your multidimension-ness of creations rock (cape that doubles as poncho -? Brilliant). Was just thinking gratefully of your blog at the end of 2009 while doing a recap of my sources of inspiration craftwise last year. Thank you for being so wonderfully, refreshingly, cleverly, ingeniously, originally different. Here's to a whole new year of even more of what you do best, L. Thank you! love the idea. ever think about adding a hood? 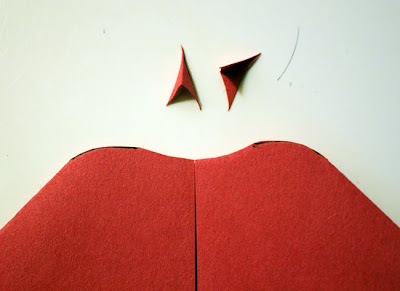 Really great tutorial and I think using the paper pattern made it a little clearer to explain things. They look lovely! Fantastic - thanks for the directions! 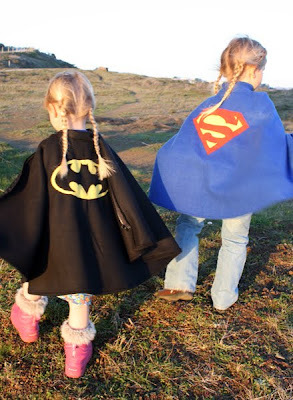 Wish my little girls were more into superheroes and less into baby dolls. These are fantastic! They look warm too! I just might have to try this. Thanks. Happy New Year. Saw this on Craft and it is brilliant. Almost worth getting married, having a baby, and waiting five years just so I could make one. Or maybe I can make one for myself! Absolutely brilliant! I'm off to buy fleece and zips. I have a little superhero here who will just about wet himself with excitement when he gets one of these! Thanks for the ace tut! Those are so great! Makes me wish my kids weren't too big for them. I'm going to bookmark for gifts though. Very cool! Hi! Just wanted to let you know that I really enjoy reading your blog and great ideas. I gave you an award today on my blog, so pop over and take a look! These are wonderful! I'm thinking of one in beige or brown for a young Jedi... You should definitely make the boots. After reading your tutorial, I am sure that you can do it. So cool, I went straight from your blog to ebay. Have all the colours I need except yellow. 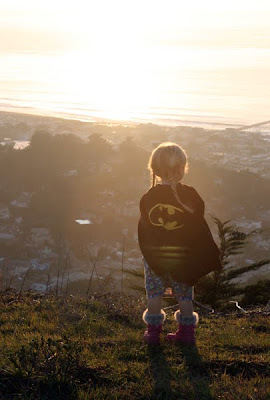 My 11 year old says that she HAS to have the Batman cape. Thank you so much for this. These are fantastic! I don't sew for beans, but this makes me want to, so badly. 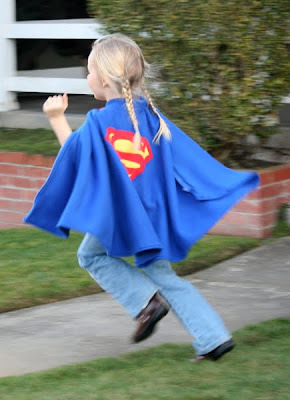 And, as a female comic book fan, I was absolutely giddy to see these capes were for little girls. They have excellent taste, and an awesome tailor! So tempted to make one for myself. Wow! Your blog is awesome. I love how it's not full of girly things. Definitely will checking you regularly. Love the cape. 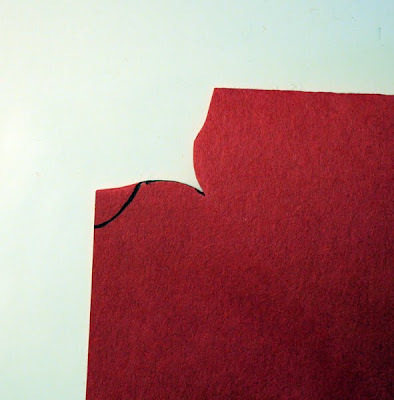 How big is the hole in the middle (in cms) for the neckline. I have made one but need to make another the one I made a blue one but the hole was a dinner plate and was too big (went over her shoulders!! - oops) but I gathered the neckline and put the collar on and put on little pockets. 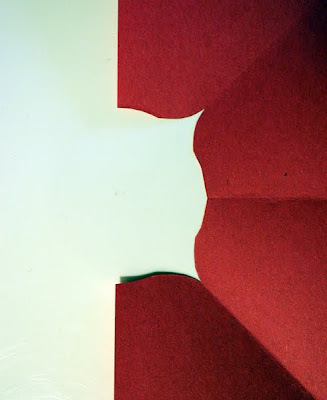 I also cut the material at an ovally shape because my 5 year old is very tall but needs to be able to get her arms out. Also lucky for me, my daughter wants to be captain america so its just a white star!! Am thrilled with results. thanks for the inspiration. Awesomeness to hear that some of you are going to make these! My kids are still dashing about in them making wooshing and zapping noises. Aimeeb, I just went and measured the dinner plate I used to cut the initial semi circle neck bit, and it was 27cm in diameter. After I'd cut the shoulder shaping and cut the lowered front neckline, when it was sewed up it worked out to make the finished collar of our capes 38cm in circumference. Hope that is helpful. I didn't really plan it in advance, just kind of winged it with what I thought looked about right. The capes you made are amazing! You have inspired me - I am going to make one for my grandson, however I do have one question. The fleece appliques on the backs were done by hand, but where on earth did you find a pattern?! 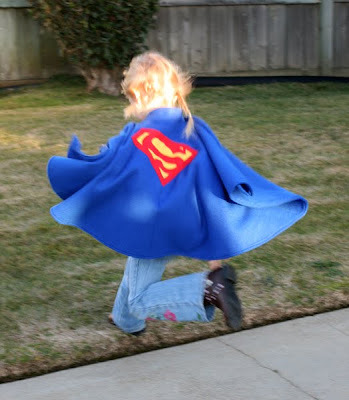 On a personal note, my son (the father of my grandson) had several capes my aunt made for him when he was little and he played in the ALL THE TIME! Your girls will love theirs and someday will make some for their children. 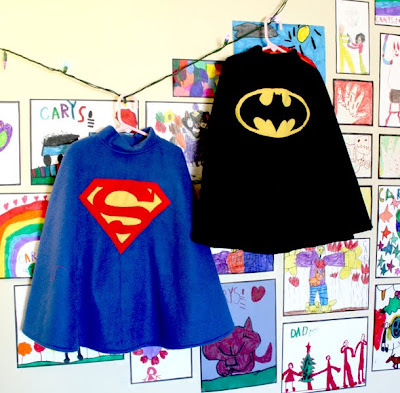 These are the most adorable superhero capes ever! Thank you so much for this post! Ha, ha, ha, fantastic. I want one. I followed all the directions quite successfully, but the only part I can't figure out is how to attach the hair elastic. How did you do it? This is so great! 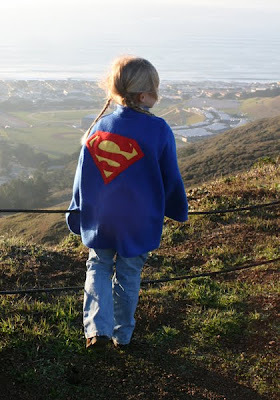 I want to make a superhero cape for my little boy and his friend, for their birthdays. I think I could do this! I am just gonna leave out the zipper (since I DO NOT really sew) and I think they will still be great! Love this idea! I might give it a try if my son is still thinking of 'batman' for his Halloween costume. Did you sew the button on, or was it the other part of the hair tie and sewn in? sorry was confused on that! I am loving this but having problems with the collar, any directions on how long it should be, etc. I am not a sewer, so this is my first attempt.:). 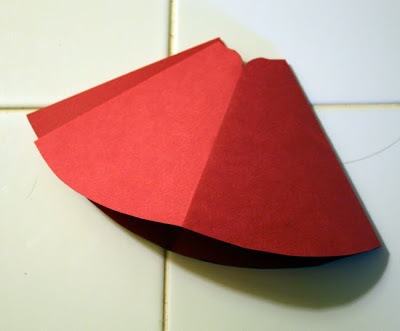 I wanted to make my son a cape, but couldn't find a tutorial I liked. And then I found yours. And I knew I had to make it. It is always cold on Halloween where I live, so it would be perfect for trick or treating. Seriously, one of the best tutorials I have ever found. I am a novice sewer but I was able to make this without much difficulty. He loves his cape, and I love that I made it! Oh, and your blog makes me swoon. I love how resourceful and creative you are! Love this! I find all kinds of stuff to make for girls, but this is an idea that works for boys as well. Thanks for the clear instructions. The hint about rounding the shoulders is important or it sits wonky, so thanks for that idea, too! Awsome idea making one right now and yes I have to handsew as well. I left the zipper out and did not make a collar but sewed a ribbon on the top to tie together and instead of superhero made college team and added ruffle trim! Thank you so much for sharing and your instructions could have not been any simpler! My daughter would love these! Thanks for sharing this tutorial. Yay for Pinterest, or I mightn't have found you! 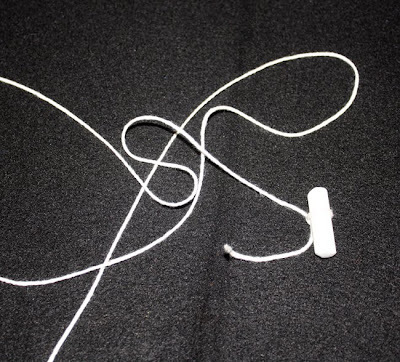 Can you tell me how long your piece of string was for your homemade compass or how wide was your fabric?? 54"?? Love this. 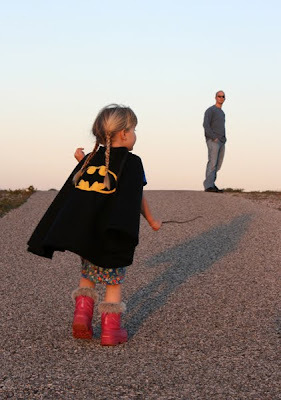 I am going to try to make one for my teen (she is 16 and loves Batman. ).